That dent left me wondering whether to claim on my insurance and get it sorted by a local bodyshop, or have a go at it myself. With the knowledge that if I messed it up I could sheepishly take to to the professionals, I decided to try and add to my skillset. The problem with these dents is that they are on a definite curve on the high point of the rear wing, so getting a good, even acceptable finish will be tough. To help me out I followed the guidelines laid out by Andy Capy in a recent MGOC magazine. The process makes heavy use of a 30cm plastic ruler. The ruler is used to apply the filler and then has the sandpaper wrapped around it to make sure I didn't sand the filler below the contour. This allows both sanding and filler to stay in line with the surrounding bodywork and aids getting the correct contour. Sand back the area of dent and at least 1" around it. Sand back filler using 180 wet and dry paper. Allow primer to dry for about 4 hours before sanding back with 1000 grade wet and dry. Now for the topcoat. As I was using an aerosol I applied 6 or 7 coats - a couple more than would be used if I were using an airbrush. When the paint has fully dried, sand it gently using 1200 wet and dry, used wet. Finally T-Cut, polish and apply clearcoat if required. You can see the final result in the photos. Whilst it is not a perfect finish - my filling and sanding technique could use some work - the repaired area is not noticeable unless you are really looking for it. As I repainted that whole upper wing, it also meant that I was able to remove some old marks and blemishes from the rest of the wing. 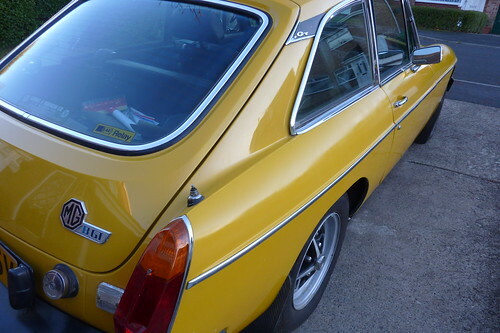 I am very relieved to see that the Halfords Inca Yellow aerosol is indeed a fantastic match for the rest of the bodywork. During the topcoat stage I was very concerned that the new paint was decidedly lighter than the lower wing, but it turned out that once the process was finished the match was almost exact. Phew!